Having a small living room is not necessarily a bad thing, it just means you have to be more creative with the items you add to your home. Filling your space with multi-functional items not only helps to save space but can even provide you with extra storage space. Decor8 Hong Kong furniture has a whole host of great items for your small living room space, but our main focus for today is the Evelyn Chaise Sofa Lounge Chair. The Evelyn Chaise Sofa makes a perfect item for your small living space, giving you an item that provides a lot of different functions without needing you to do anything. Feeling tired and just want a quick nap? The Evelyn makes a great spot to rest those tired eyes with those comfy foam filled seating cushions and fluffy back cushions. Whether you are watching TV or just want to cuddle up with a good book, this is sure to be one of the best spots where all your family and friends will fight over. Getting intimate with your loved ones can be a precious moment and we can’t think of any better way to spend it, than to spend it on the Evelyn sofa at home. You don’t have to worry about the colour either since it comes in a whole host of colours. You are sure to find a colour to fit perfectly with the style of your room. Can’t find the colour you want on our website? Come on down to the showroom and we can show you the fabric. You don’t just get to see the beautiful colours that are available but get to touch the fabric to confirm it’s amazing quality. Whilst in the showroom, you could view some coffee tables that may look superb sitting in front of your Evelyn sofa. 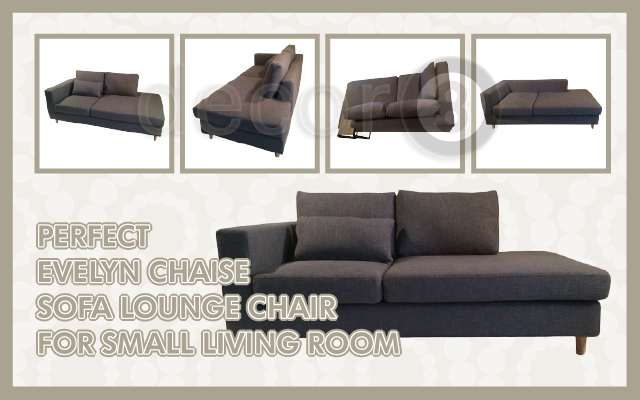 This entry was posted in Chaise Lounges and Daybeds, Lounge Chairs, Sofas and tagged 2 seater sofa, chaise lounge chair, decor8 sofa, lounge chairs, modern design, modern sofa, quality sofas, small sofas, sofa hong kong, sofas for sale, unique sofas.